Gort is a Nord warrior who works as a ferryman in Windhelm. He wears a set of farm clothes with a pair of boots and defends himself with an iron war axe. You can hire him to sail you to Dawnstar or Solitude for 50 gold, or Icewater Jetty for 500 gold. When you first speak to him, he'll ask where you'd like to go. 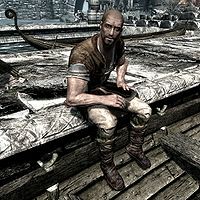 If you tell him you want to go to Dawnstar or Solitude, he'll say "Climb on in the boat and get comfortable." After you're seated, he'll say "You just enjoy the fresh air and leave the rowing to me." However, if you tell him you're interested in traveling to an island near the border to High Rock, he'll answer "The one with the ruined castle? Don't you know that place is cursed? Even seasoned sailors steer far around that place." Telling him you need to go there anyway will result in the answer "I'll take you as far as I can, but I'm not hanging around and it's gonna cost you extra." He will then reluctantly tell you "Climb on in and let's get this over with." If you don't have the gold he asks for, he'll be annoyed, and reply "You think I do this for my health? Come back when you've got the coin." He is one of the few named NPCs in Skyrim who is set to respawn. This page was last modified on 1 May 2016, at 22:36.